Fashionista writer, Whitney Bauck, wrote a stellar piece asking the question “Why Does So Much Sustainable Fashion Look The Same”? Although neutral colors and earth tones dominate the ethical fashion space, we are always trying to illuminate women of color who often bring elements of art, culture and vibrancy to conscious collections. We had the honor of chatting with Sheena Sood, founder of abacaxi (pronounced uh-bah-ka-shee). This brand was created with the philosophy that wearing beautiful, handcrafted pieces that are imbued with history lead to a happier and more inspired human. Sheena started her brand in 2013 after working full time with another job as a designer. She left and went to India for a couple of months (where her parents lived at the time), and she really took a break to explore and figure out what inspired her. Her first capsule collection was inspired by her trip to Rajasthan, India and infused vintage embroidered textiles with bold and playful colors. 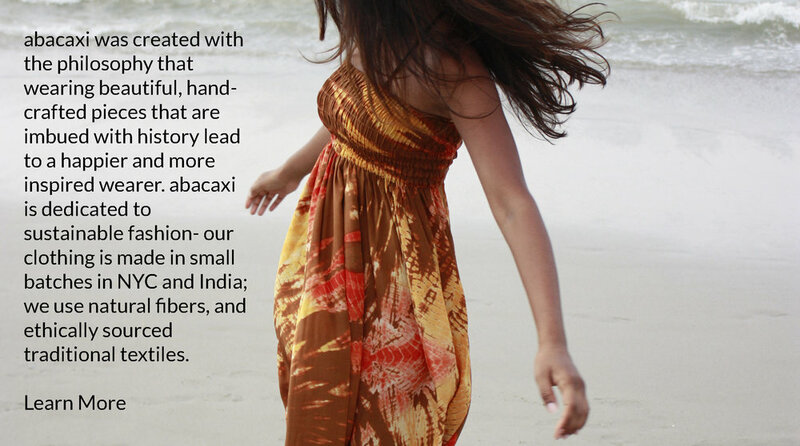 abacaxi is a proud independent ethical designer who works on limited edition small quantity pieces all made in NYC! Focused on small production, all of her pieces are made by hand she minimizes waste by using all of her excess fabric. For example, with her latest collection - Shibori Collection- each fabric is dyed by hand and excess fabric is used to make pouches which carries each set of overalls. Sheena works to source textiles from artisans whenever possible. She loves using traditional textiles from all over the world in very wearable and modern ways. Although she is not 100% sustainable and still uses chemical dyes, she aspires to use all natural dyes in the near future. Her current Tie Dye collection was inspired from an artist residency in which she started working on Shibori techniques while silk screen printing on top. 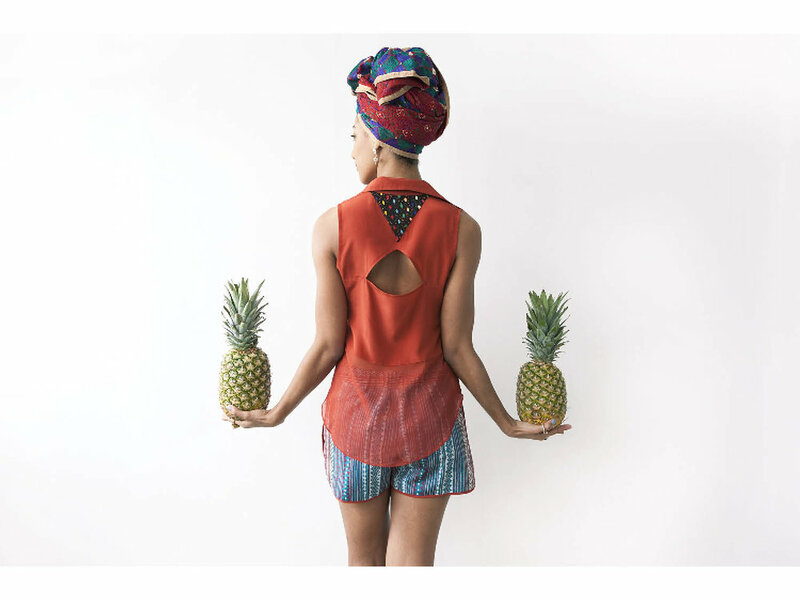 We love that all of abacaxi’s capsule collections are inspired by travel and just life in general. She designs for herself and her community in mind. Keeping consistent with a unique urban-island aesthetic, each collection has it’s own beautiful language. We also love how transparent Sheena is about openly sharing that she is a Woman of Color.